This Veal Burger is my idea of a real indulgent treat, a rose veal patty is accompanied by nutty Gouda cheese, Parma Ham and sticky cooked Onions. A good burger is a thing of great beauty and my veal burger is a great burger! In many ways really simple but also really indulgent. Just like most food I think greatness lies in attention to detail! 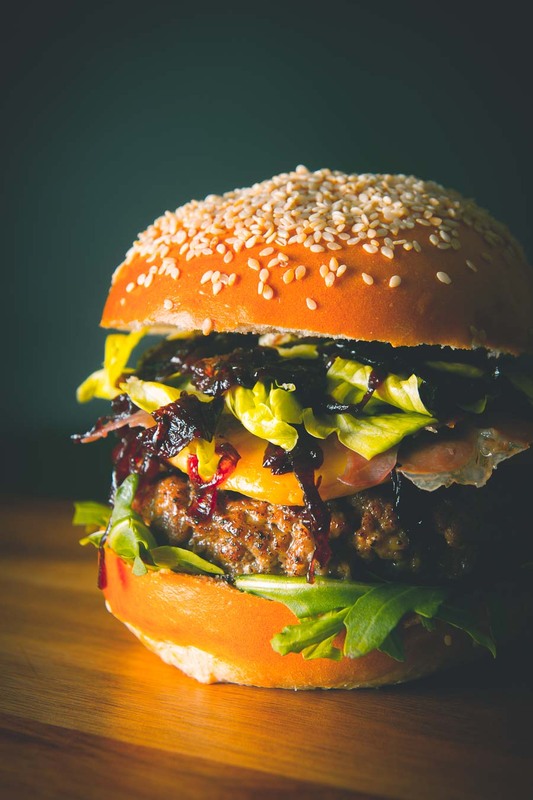 So the Parma ham for this gourmet burger is cooked between two baking sheets so that it does not shrivel up. It isn’t just because it looks better but it eats better too. You don’t get one piece of shrivelled up ham in the middle but a single layer in every bite. But whilst we have the oven on we may as well get the cheese perfect too. For me, Gouda is the perfect burger cheese. It melts fantastically well and has the most wonderful nutty sweet taste. Most importantly it does not overpower the other flavours you have got going on. I don’t screw around with apologetic little slices of cheese on my burgers either. A beast of a slice 1cm thick (around 100g in weight) goes in the oven to begin to melt before it is added to the cooked burger. As for the onions, I’ll just leave the idea of super slow cooked onions that are made sticky with port and brown sugar. If you are still watching your waistline this January may I suggest you skip this veal burger until, well until you stop being silly. You know I am joking, right? Or am I? There is no reason that a burger should not be a ‘gourmet’ experience. It should not be a throwaway meal! 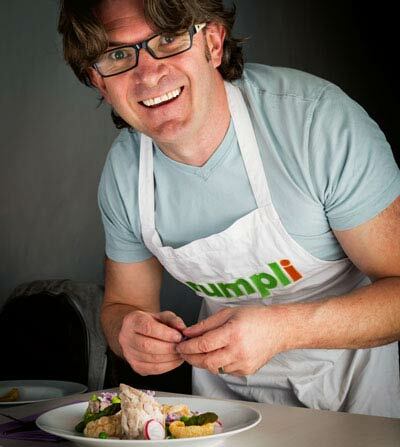 I have 4 other gourmet burger recipes here on Krumpli and all of them are a little bit special. So if veal is not your thing check out these bad boys! Venison Burger with Blue Cheese. Spicy Bean Burger with a Peach Chutney. ‘Just’ A Chicken Burger (honest). In recent years a gourmet burger seems to become to mean a massive monstrosity burger. The flavours do not need to compliment and contrast, it needs to be massive! Now when it comes to burgers I have a very personal idea of how big they should be! They should be big, towering but not too much so. A burger should be able to be eaten, by that I mean you should be able to pick it up and eat it with two hands. If you can do it with a single hand it is too small. It should also be constructed in such a way that the food should stay within the bun and not end up all over the plate when you are eating it. But if you require a stake or knife to impale it so that it stays together whilst sat on a plate then it is too large or poorly constructed. This veal burger ticks every single one of those boxes! However, now I have put my burger thoughts down in writing I have come to think I need a therapist. I had no idea I was so obsessive over something as “simple” as a burger! The Case For Eating Veal. On a serious note many people seem to be a bit squeamish about eating veal. It is true they are young cows but no one seems to worry about the fact that chickens, lamb and pork we eat are all young too. Veal had a bad rep for being young male calves that are a bi product of the dairy industry being kept in torturous conditions. They were fed on a formula to produce delicate pale meat that tasted divine but ethically left a very bad taste. There has been a defined move by a number of producers in recent years to reclaim male cows from the dairy trade. In fact, across Europe, many of the worse practices have been illegal for 10 years. But as a result of this, male offspring from a dairy heard were routinely shot at birth. It was cheaper than raising them as they had little or no value in the market. Sorry of this is all a bit real but it is true and I don’t do it very often. But I firmly believe we should all have an awareness of what our food is and where it comes from. There is a movement towards creating rose veal, a wonderful product sent to slaughter at 6 months. Young yes, but a similar age to commercially produced lamb and pork. This results in a beautiful rosey pink coloured meat from an animal that is a bi product of the dairy industry. Something I think we should all be able to get behind. So hunt down a local supplier of a product we should all be eating more of and put an end to one of the most perverse forms of waste in the food chain. Heat the onions and oil in a small-medium pan over a low heat and cook for an hour stirring every 10 minutes or so. When the onions are a deep dark brown, add in the sugar and stir until dissolved and then add in the port and bubble down until sticky and dry, taste and add salt as required. Now take your veal, making sure it is not fresh out of the fridge and season with the black pepper, sandwich it between baking parchment and form two 200g patties. Do not salt your patty just yet as it will begin to cure the meat and drive out liquid and no one loves a dry burger. When your patty is formed allow to rest at least an hour before cooking. Preheat your oven to 200°C, if you are cooking n a cast iron pan place it in the oven as it warms up to give it a head start. Take two baking trays that nestle into to each other (optional), place a layer of baking parchment in the first followed by the Parma Ham, followed by another layer of baking parchment. Place the next baking tray in the first, then add a layer of baking parchment followed by the two slabs of cheese and a further layer of baking parchment. When your oven is up to temperature, place in the baking trays and heat your frying pan or skillet over a medium high heat on the stove top. 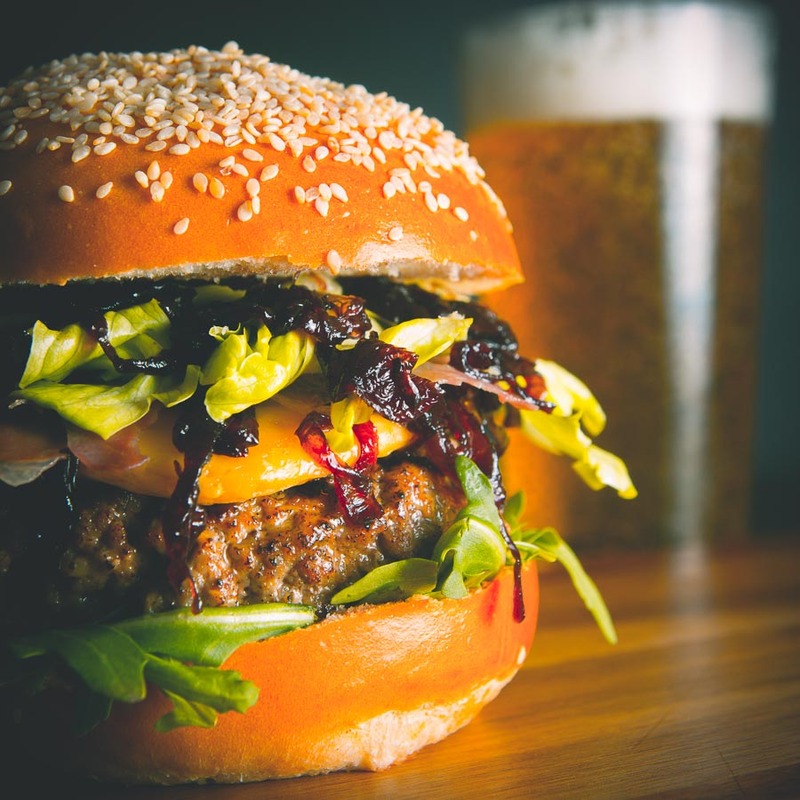 Oil each burger patty and sprinkle with a generous amount of salt then cook in the skillet for 5-6 minutes, check the meat isn't burning, if so reduce the temperature. Flip the burger and cook for another 5-6 minutes. Now remove the burger, slice the buns in half and toast for 60 seconds in the pan you cooked the burgers. Now build, I start with rocket, followed by burger, some onions, baked cheese, Parma ham, then iceberg lettuce and finally some more onions. *Make sure your butcher leaves a little fat you are looking for around 15-20% fat to keep the burger together and juicy. Feel free to increase the quantities for the onions. We make them in bulk on occasions and use them for everything from cheese on toast to a luxurious addition to a stew. Wow! These photos are gorgeous! What a burger! My husband would love this. I do love a burger and this one is definitely a proper job! Every ingredient is there to do the veal justice and it looks like a complete meal in one too. 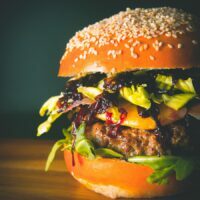 This beautiful burger has left me mouthwatering- gorgeous recipe and such a great capture! Great work Brian ?? My mouth is watering like crazy over this burger. It’s been ages since I’ve had veal but I think that ends right now. 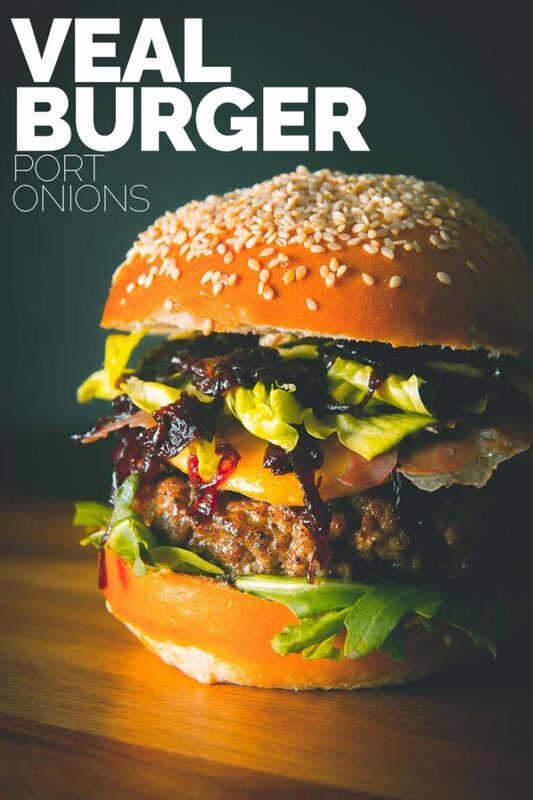 Gosh that burger looks the biz. I think ethically sourced veal is the way to go for sure. Your picture of the burger certainly is a thing of beauty. Great combination of flavors and texture! I would agree with making use of more ethically produced veal too Brian and I don’t think you were “too real” in your writing on the subject. The modern westernised world is far too removed from what real food is, so keep on posting it like it is. And you know I love this pornographic burger! Hungry Hubby would break out into a feverish sweat if he were looking over my should at the sight of this right now lol. It was interesting to read your explanation of veal – if you buy ethically sourced meat then you’re right, it’s not really any different to eating lamb or any other young meat. My husband loves the riceness of veal, but I don’t think he has ever had it in a burger before. That is one epic looking burger. Thanks Dannii, Veal is wonderful ingredient I would love to see people use more often.